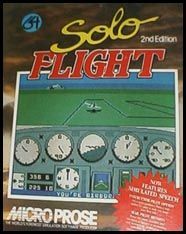 Comments - One of the earliest sims, SoloFlight hails from the days when the Commodore Amiga reigned king of the graphics world! " ... the most famous thing about it was the speech synthesis, in the form of flight control guiding you through the flying, telling you to pull up your flaps, etc. and taking you through your landing routine." 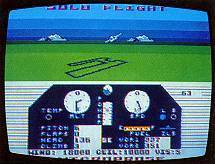 Solo Flight was released in 1984 on the Atari 800 and CBM 64.
" It had you flying a single engine mail plane from small town to small town in America, with the weight of your mail influencing the handling of your plane. the flying was pretty realistic and the most famous thing about it was the speech synthesis, in the form of flight control guiding you through the flying, telling you to pull up your flaps, etc. and taking you through your landing routine." MiGMan thanks Michael from alt.emulators.amiga for his recollections. MiGMan thanks Demetrius Kiminas at www.gamebase64.com for the scan. Gamebase 64 is engaged in a collective effort to catalogue and document all Commodore C64 software before it's too late.